For Cross Church, Sunday, November 6 was important for two reasons. First, it kicked off the week of prayer for missions. During the week, we prayed daily with our church family from North Richland Hills Baptist Church for missions partners around the world. Second, at Cross Church and at churches around the US, it was national orphan day. At first glance, these two issues are seemingly unrelated. However, at closer inspection, we can see that the two are crucial issues for the church to address. They are both important because God has given his people a mandate regarding missions and orphan care. It is the responsibility of every believer to take the gospel to the nations. It is not merely the responsibility of the vocational missionary, but of every Christian. One of the biggest objections to the faith is fate of those people, from all around the world, who have never heard of the gospel. Scripture is clear. Those who die apart from Christ, live eternally separately from him. Questions then arise: what kind of God is this? How dare he condemn those who never had the chance to believe. However, I don’t think this problem lays at God’s feet. That there are people in this world that will never hear the gospel and spend eternity in Hell is not an indictment against God, but against God’s people. God has given the task to his people. We must take the gospel to the nations. The Hartford Institute for Religious Research pegs the number of Christian (Protestant, Catholic, and Orthodox) churches in the US at approximately 338,000. Church Relevance puts it at a slightly lower number of 320,000. As others have famously quipped, if only one to two couples per American church would foster-to-adopt, each orphan in America would have a mom and dad, a family that loves them, and a place to call home. Again, that there are orphans in this country is not an indictment against God, but against God’s people. Janet and I adopted our oldest son, Parker. One of the most consistent questions we are asked is about our relationship with Parker’s birthmom. We don’t feel threatened by her. She can’t and wouldn’t take Parker from us. She made the most loving decision a person can make. And because of her, we have the privilege of being Parker’s parents. If you’ve ever had second thoughts on adoption due to your fears of a birthmom, let me encourage you to watch the powerful video below. This isn’t Parker’s birthmom, but a young woman who made a tremendous sacrifice of God-given love. It would be too easy to look to others. To look to professional missionaries to take the gospel to other nations. To look to other families to adopt rather than your own. If you are a follower of Christ, God has given you the responsibility. Don’t look to the right or to the left. It is your responsibility. Live up to it. A couple weeks ago a brilliant video went viral about adoption. In the video, an adoptive dad and pastor (yes, pastors can be funny too…well…some pastors) addresses insensitive comments his family has received about his adopted children. My oldest son is adopted and my family is patiently (and sometimes impatiently) awaiting the adoption of our third child. For whatever reason, adoption and infertility seem to invite the most intrusive questions. We too have been subjected to some insensitive, albeit it sometimes well-intentioned, comments and questions. We’ve been asked questions like, “will the birthmom come and take her kid back?” and “will you love Parker (our adopted son) as much as you love Jonathan (our biological son)?”. People love to ask intimate details about our dealings with infertility or about our birthmom. Often, these questions or comments are well-intentioned, so we do our best to season our response with grace (when what I sometimes want to do is respond with intimate questions in turn…). “MYTH: There are very few babies being placed for adoption. REALITY: 20,000 or more U.S.-born infants are placed for adoption each year – as many or more than the number of international adoptions yearly. MYTH: Adoption is outrageously expensive, out of reach for most families. REALITY: Adoption is often no more expensive than giving birth. Costs to adopt domestically average $15,000, before the $10,000 Adoption Tax Credit and benefits that many employers offer. REALITY: The average time span of adoption is one to two years. MYTH: Birthparents can show up at any time to claim their child. REALITY: Once an adoption is finalized, the adoptive family is recognized as the child’s family by law. Despite the publicity surrounding a few high-profile cases, post adoption revocations are extremely rare. MYTH: Birthparents are all troubled teens. REALITY: Most birthparents today are over 18, but lack the resources to care for a child. It is generally with courage and love for their child that they terminate their parental rights. MYTH: Adopted children are more likely to be troubled than birth children. REALITY: Research shows that adoptees are as well-adjusted as their non-adopted peers. There is virtually no difference in psychological functioning between them. MYTH: Open adoption causes problems for children. REALITY: Adoptees are not confused by contact with their birthparents. They benefit from the increased understanding that their birthparents gave them life but their forever families take care of and nurture them. MYTH: Parents can’t love an adopted child as much as they would a biological child. Thank you for everyone who purchased a raffle ticket for the iPad Mini drawing. We raised $500 towards the $15,000 needed for our adoption. Thank you! This is the first of two iPad Minis that we will be raffling off – we will not begin selling tickets for the second drawing just yet. I will let you know via facebook, twitter and this blog about the next drawing. We are a little more than half-way to our goal of $10k but we have an exciting development. 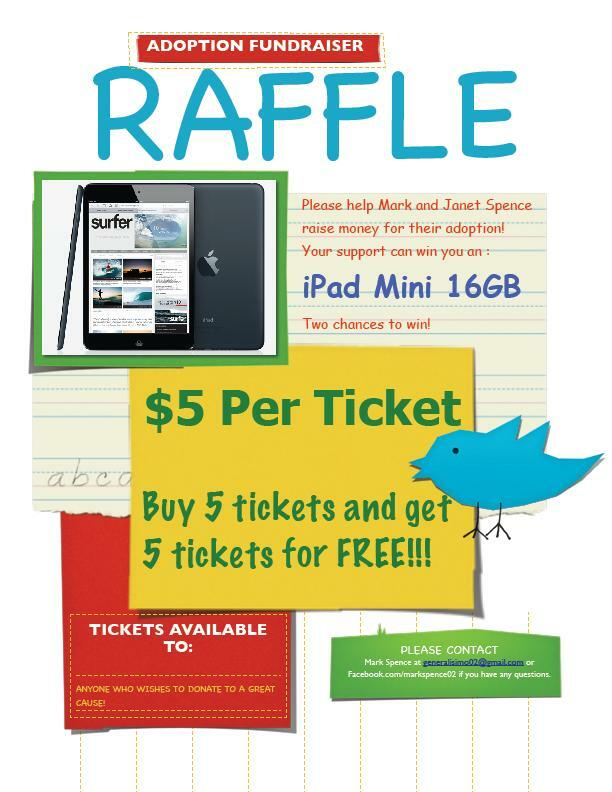 My sister and her husband have given us 2 iPad minis to raffle for the adoption. We will start the raffle for the first iPad mini tomorrow. The drawing will be held when we sell 100 tickets. As you can see above, whomever buys 5 tickets will get 5 tickets free. I will have tickets on me at all times. If someone wants to do it through Facebook/Twitter/PayPal or whatever, we will assign you a number and drop that ticket in the hat. If we have to ship the iPad, we’ll cover shipping (within reason, friends who live overseas!). I do plan on buying 5 tickets, just FYI. Thus, I will not be the one drawing the ticket from the hat. The second raffle will be held subsequently. Please contact me if you have any questions. Four and half years ago we embarked on a life changing journey of adoption. Throughout the process of bringing Parker home we were overwhelmed by all the prayers, love, and support showered on us. God was faithful and gave us more than we could have ever hoped for or imagined. Parker’s birthmom blessed us with the wonderful gift of parenthood. Even though we learned that Janet could in fact get pregnant by the unexpected arrival of Jonathan, our heart for building our family through adoption has never changed. When you choose to adopt a child there are many pieces that have to come together. Extensive paperwork needs to be completed, documentation must be gathered, home inspections performed, interviews with our agency, and a profile created that best represents our family to potential birthmoms. We have finished these details and are asking for your help to complete the last piece of the process- raising enough support to finish funding our adoption. 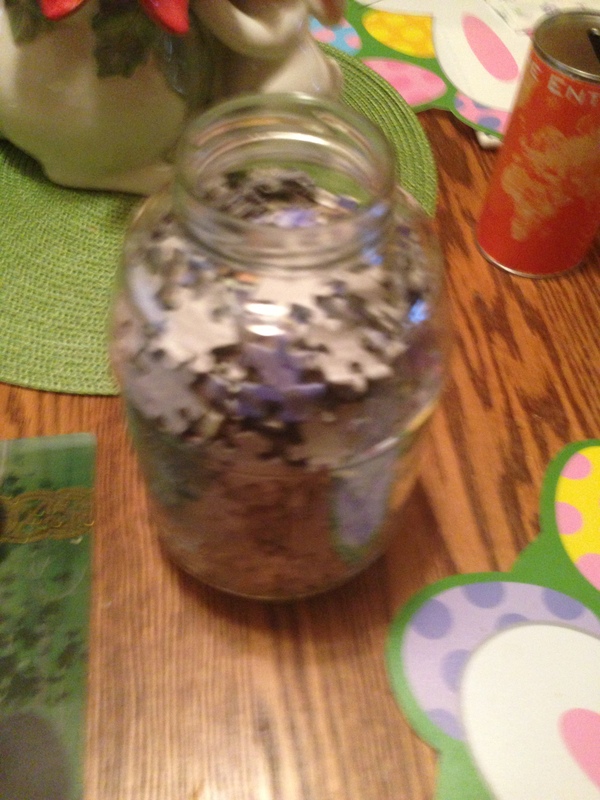 We have purchased a 1,000 piece puzzle and are selling each puzzle piece for $10.00. We are asking that you consider buying one or more pieces of the puzzle. As the pieces begin to come together, we will work the puzzle, and write on it all the names of friends and family who took part in helping bring our baby home. We will hang the framed puzzle in the baby’s room as a reminder of God’s faithfulness and your generosity. We know that we are not the only ones involved in adopting this baby. Our friends and family are a big part of the process as you choose to love and support us through this next journey as you have before. We covet your prayers for our birthmom- that she will have the courage to make such a difficult choice and feel God’s peace every step of the way. We ask that you pray for us as we wait to be matched and rest in God’s perfect timing. If you would prefer to use paypal, you can send money through your paypal account to mark@nrhbc.org. Below is a video of Willie Robertson of Duck Dynasty fame speaking about adoption. Thank you to a friend on Facebook that posted the video to her page. For those of you who know the story of my family, Willie’s story will sound familiar. Janet and I also had the joy of adoption. In 2008, having experienced infertility, Janet and I decided to adopt. After filling out extensive paperwork and waiting for several months, a wonderful young lady picked us to be the adoptive parents of her soon-to-be-born baby boy. This young lady, our birthmom, made the most amazing, loving and self-sacrificing decision a person could ever make. We were and continue to be the blessed recipients of her decision. On December 26, 2008, our son, Parker was born. Parker is Hispanic (the one on the left in the picture). On January 1, 2009, we were able to take him home from the hospital after a short stay for Parker in the NICU (the reasons for his stay were nothing major). Little did we know that Janet was already pregnant. On September 1, 2009, our second son, Jonathan (Jay) was born. God blessed our family in a mighty way – a little bit too mightly on many occasions. God blessed Janet and I by adoption into his family. He blessed us again by giving us Parker through the miracle of adoption. Let me challenge you in the same way as Willie. Please consider adoption. Please encourage adoption. If you have not been adopted into God’s family, please consider surrendering your life to Jesus Christ.